Absolutely! The two-piece rear bulkhead and rear floor panel greatly facilitate your inspection of the tail cone area, its contents, and the flaperon actuator components. Taildragger tow bar or tow rope? How do you wash and oil filter? ....and don't forget our infamous summer firestorms and winter deluges! Wheel Skis or Just Skis On a RV-6? Having briefly flown a ski-equipped 7AC I am certainly no expert. However, wouldn't the modest clearance between the aft edge of the lowered flaps and the snow-covered ground potentially be an issue? 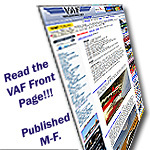 Airhound -- https://www.vansaircraft.com/service-information-and-revisions/n-2016-12-14/ -- for "AOA Quick-Release" info. Have you checked for any "parasitic current" drains that might be discharging your battery prematurely? Many useful videos in this regard on YouTube -- see: "parasitic current draw test". BTW, when I received the factory trim tab plate it was pre-bent. When installed it perfectly centered the ball and there was no need to tweak it. The carb bowls are continually vented to the atmosphere via the short clear plastic vent tubes. I suspect that the fuel pressure has nothing to do with sinking floats. Just a couple of drops of gas a couple of times a year seems to keep my caps happy. EZ Lube, etc. is just too sticky for this use. All you need is a "rivet shaver bit" for your micro-stop -- such a bit is not that expensive (aircraft cost-wise ;)) and is a useful tool to have in your aircraft building toolbox. How about restocking the missing "RV-12" decals in BLACK in 6" and 12" sizes. They have been unavailable for several years. Could use some "RV-12" hats as well. That is ROTAX's Service Letter SL-912-016R1. Section 3.1.3 pertains to MP and appropriate operating limits. One assumes that you have also installed the automatic thermostatically-controlled heater/cooler coils inside the cup holders. What kind of fuel were you using? 100LL? Auto 91 with 10% ethanol? Auto 91 without ethanol? HELP! Mixture cable apart, can’t reinstall!